I thought it was worth rounding up the last few finds from Spain. 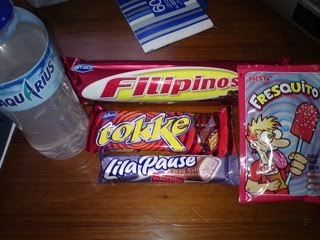 These were actually the first bunch of snacks I bought from a small sweet shop in Granada that must have thought I was a bit crazy (about half of the haul is pictured). First we have a bottle of Aquarius, but I covered that in detail in a past review. Then we have the Filipinos. These are little dark chocolate rings with biscuit inside. The covering is nice and the hole adds to the experience but they aren't anything too special. They come in 3 flavours so are possibly quite popular. The remains of the packet made it home demonstrating that while enjoyable I just didn't click with these. I remember Lila Pause from previous visits to the continent and TV adverts from Sky TV international stations of years gone by. I should have bought a few more of these as the softer-than-Aero fruity centre is really a treat. I'd happily buy these in the UK. Tokke is a Euro style wafer bar, surprisingly without caramel but it is all the better for it. I think it should have slotted in with the Leo and Kit-Kat reviews but it's probably more substantial than either of those. While it was filling and enjoyable I'd rather have biscuit than wafer I think so I'm unlikely to have it again. The Fresquito looks fun but I still haven't tried it. It seemed a good idea in the store but wandering around towns with a lolly & sherbet is probably not typical tourist fare. 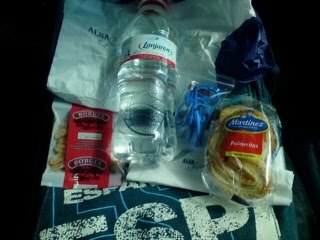 As an addition here is an example of the packed lunches we got on the Super-Economy busses between towns. In the UK you'd pay far more for the ticket and get a cramped bus that smelt like the on-board toilets. In Spain the bus has aircon, movie, free WiFi, headphones, 3 to a row reclining leather seats & enough leg-room for a 6'4" person like me. The peanuts were nice, the biscuits were a bit dry and the water wasn't Aquarius, but included in the low price it was a great addition to the service and I'd recommend using the Super-Economy intercity bus services if you happen to be out that way.